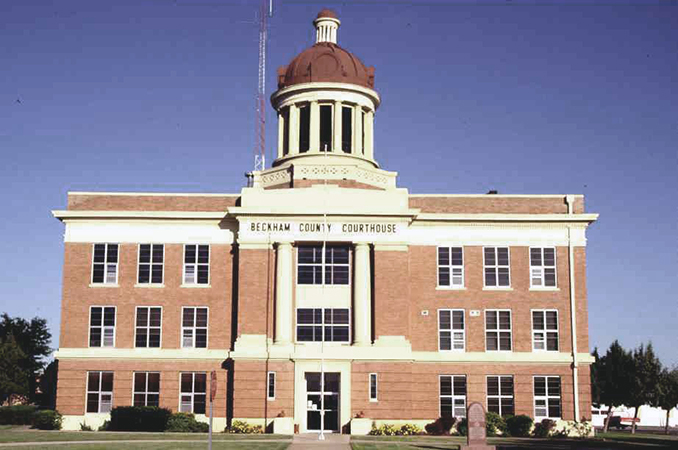 Established at 1907 statehood, Beckham County is situated in southwestern Oklahoma. It was formed from the northern portion of Greer County and the southern portion of Roger Mills County. Named in honor of Gov. John C. Beckham of Kentucky, the county is bordered by Roger Mills County on the north, Custer and Washita counties on the east, Greer and Harmon counties on the south, and Wheeler and Collingsworth counties, Texas, on the west. The county is drained by the North Fork of the Red River. Among the numerous tributaries that flow into the North Fork are the Timber, Sweetwater, and Buffalo creeks. The northwestern corner of the county lies within the High Plains, and the remainder of the county lies in the Gypsum Hills physiographic region. Two significant archaeological sites represent the area's prehistory. Excavation at the Certain Bison Kill Site near present Elk City during the 1990s uncovered bone remnants and a butchering tool. Archaeologists have determined that American Indian hunters killed bison at this site circa 200 B.C. and A.D. 500. At the Edwards Site (National Register of Historic Places, NR 73001554), near present Carter, archaeologists have discovered beads, arrow points, and pottery fragments used by buffalo hunters between A.D. 1500 and 1749. The Spanish were the earliest explorers and adventurers in the area. In the 1600s and early 1700s they traveled via the Great Spanish Road, which passed through present southwestern Oklahoma. Later, in 1852 American explorer Randolph B. Marcy investigated the area of present Beckham County, while searching for the source of the Red River. In 1803 present Oklahoma was included in the area known as the Louisiana Purchase. During the early 1800s the Choctaw and Chickasaw were relocated from the southeastern part of the United States to the southern portion of Indian Territory (I.T. ), now Oklahoma. In 1855 the federal government leased the western portion of their lands, known as the Leased District. This area was located in southwestern part of present Oklahoma. Through the Reconstruction Treaties of 1866 the Choctaw and Chickasaw ceded the Leased District to the federal government. By presidential proclamation of August 1869 the Cheyenne and Arapaho were assigned a reservation in that district, which included the northern part of present Beckham County. Following the Civil War (1861–65) cattle drives from Texas to Kansas crossed this area via the Western Trail. During the late 1800s Texas cattlemen leased land from the Cheyenne and Arapaho in order to graze their cattle on reservation land. Following the allotment of land to the Cheyenne and Arapaho, the area was opened to non-Indian settlers on April 19, 1892. After the Cheyenne-Arapaho land opening, six counties were established, one of which was F County (later Roger Mills County). Before Beckham County was created at 1907 statehood from Roger Mills and Greer counties, early towns were initially situated in those areas. Beckham County's boundaries have changed several times. In 1910 a portion on the south was annexed back to Greer County. On March 17, 1930, the U.S. Supreme Court ruled, based on a survey accomplished by Samuel S. Gannett between 1927 and 1929, that the true 100th Meridian, the boundary between Texas and Oklahoma, was actually thirty-eight hundred feet further east. Thus, Beckham County's western boundary was changed, further reducing the county's size. Beckham County came to comprise 904.14 square miles of land and water area. At 1907 statehood Sayre was temporarily selected as the county seat. However, Sayre continued to host county offices after winning by a small margin over Erick in a June 1908 election. A two-story, brick building served as the first courthouse until a three-story replacement was completed in 1911 and dedicated in 1912. Designed by the Layton, Wemyss Smith and Hawk architect firm, the structure was a blend of Neoclassical and Second Renaissance Revival styles. It featured a dome with a colonnade that supported a roof with a smaller, replica dome. The courthouse was added to the National Register of Historic Places in 1984 (NR 84002968). Beckham County's economy has been principally based on agriculture and livestock raising. Major crops have included cotton, wheat, alfalfa, Kaffir, milo maize, and broomcorn. In the late 1920s the county ranked fourth in Oklahoma for the number of cotton bales ginned. Livestock numbered 15,889 cattle, 4,590 horses, 3,813 mules, 1,611 swine, and 417 sheep and goats. In the 1930s there were 3,135 farms, averaging 174 acres each. Those farms were operated by 1,752 tenants, 1,373 owners, and 10 managers. The 1931 Oklahoma Almanac claimed that Beckham County had ten thousand dairy cows and had marketed seventy-seven thousand bales of cotton. During the 1940s the number of farms declined from 2,424 in 1940 to 2,169 in 1945. In 1960 Beckham County had approximately twenty-five thousand head of beef cattle and forty-two hundred dairy cows. By the turn of the twenty-first century the number of farms had dwindled to 825, consisting of 499,444 acres. In 2001 eighty thousands acres were planted in winter wheat, nine thousand acres in alfalfa hay, and eighty-five hundred acres in rye. At that time Beckham County had forty-five thousand cattle and five hundred sheep. Mineral industries have had a sporadic and limited impact on the county's economy. In the first half of the twentieth century entrepreneurs manufactured salt near Erick. In the 1920s several petroleum companies drilled oil and gas wells around Sayre and Erick. Between 1948 and 1969 oil wells were being drilled near Elk City. In 1958 mineral industries in Beckham County employed 364 individuals and had an annual payroll of $1.7 million. In the late 1970s and early 1980s an oil boom and bust occurred. County residents could receive a higher education beginning in 1938 when Sayre Junior College opened. The facility closed during World War II but reopened in 1946. In 1987 it became a branch of Southwestern Oklahoma State University. The Sayre branch of the Western Technology Center held its first classes in 1995 and continued in operation at the turn of the twenty-first century. Early transportation routes followed the waterways and American Indian trails. The Great Spanish Trail, originating in Santa Fe, New Mexico, entered Oklahoma near present Erick and ran along the Red River and the North Fork of the Red River. Cattle drives through the area used the Western Trail, which connected Doan's Crossing on the Red River to Dodge City, Kansas, and passed through present Elk City. The Camp Supply Road connecting Camp Supply (later Fort Supply) in present northwestern Oklahoma with the Red River traversed the western portion of present Beckham County. The Choctaw, Oklahoma and Gulf Railroad (controlled by the Chicago, Rock Island and Pacific Railway) built a line traversing the county east and west between 1901 and 1902. In 1910 the Wichita Falls and Northwestern Railway (later the Missouri, Kansas and Texas Railway) connected Beckham County towns from north to south. Historic Route 66, which came through Beckham County in 1928, was replaced by Interstate 40 in 1975. By the mid-1940s numerous bus lines such as the Santa Fe Trailways, the Panhandle Trailways, the Oklahoma Transportation Company, and the Greyhound Bus Lines provided transportation. At the turn of the twenty-first century Beckham County was served by Interstate 40, U.S. Highway 283, and State Highways 6, 30, 34, 55, and 152. Municipal airports existed in Elk City, Erick, southeast of Sayre, and in the unincorporated town of Delhi. At 1907 statehood Beckham County's population stood at 17,758. It rose to 19,699 in 1910, only to decline to 18,989 in 1920. Population peaked in 1930 at 28,991 and dropped to its lowest point of 15,754 in 1970. Due to the oil boom and bust, it rebounded to 19,243 in 1980 and declined to 18,812 in 1990. At the turn of the twenty-first century the county had 19,799 residents. Of the 22,119 living in Beckham County in 2010, 85.0 percent were white, 4.0 percent African American, 2.8 percent American Indian, and 0.8 percent Asian. Hispanic ethnicity was identified as 16.3 percent. At the turn of the twenty-first century the leading industries were retail trade and health care. Only six companies in Beckham County had more than one hundred employees. The incorporated towns of Beckham County are Carter, Elk City, Erick, Sayre, Sweetwater, and Texola. Other incorporated towns have included Hext, Mayfield, New Liberty, and Retrop. "Beckham County," Vertical File, Research Division, Oklahoma Historical Society, Oklahoma City. Linda D. Wilson, "Beckham County," The Encyclopedia of Oklahoma History and Culture, https://www.okhistory.org/publications/enc/entry.php?entry=BE008.